A birth cohort study of more than 180,000 children in China shows a modest connection between non-medical C-sections and childhood obesity. The study was published in the journal Pediatric Obesity and comes on the hind side of reports that China is now considered one of the fatter nations in the world. Previous studies have concluded a correlation between voluntary C-sections and childhood obesity exists, but these studies were small-scale. Researchers attempted to reinforce the connection with a larger birth cohort study including 181,380 children. Children born via C-section, both voluntary and medically-necessary, were more likely to suffer childhood obesity than children born vaginally, but the increase was modest. 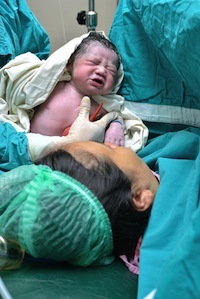 After adjusting for maternal and other complimentary risk factors, obesity odds between C-section and vaginal births was 1.18 to 1. Source: Li H, Ye R, Pei L, Ren A, Zheng X, Liu J. Caesarean delivery, caesarean delivery on maternal request and childhood overweight: a Chinese birth cohort study of 181 380 children. Pediatr Obes. 2013 Mar 19. doi: 10.1111/j.2047-6310.2013.00151.x.